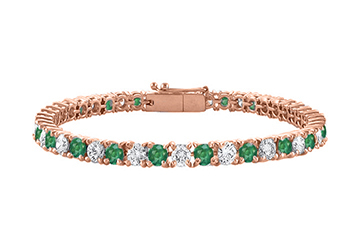 A continuous row tennis bracelet of round created green emeralds and brilliant cut triple AAA quality cubic zirconia alternated and holds in prong mounting. The entire bracelet is crafted from 925 sterling silver over 14k rose gold vermeil and a secured safety clasp. This cubic zirconia and created emerald tennis bracelet total gem weights of seven carat and bracelets measures 7 inch.